Rebecca J. Carlson: Draft One Finished! 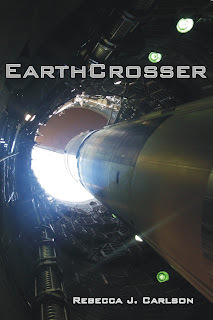 Nine weeks and three days after I sat down to write the first chapter, Earthcrosser is drafted! I expect its 49,378 word count to grow a bit in the revision process since I need to add little things like descriptive details and transition sentences, things I can't bother with when I'm in the heat of the action. I can't say that this first draft is very good. It needs a lot of work. If you were to read it now you would find the setting shifts around in impossible ways. Characters vanish over chapter breaks. Things that happened over night turn out to have taken three days instead. The asteroid's closest approach gets pushed back a week (dang, if the author could do that, then what's the problem?). But who cares? Everything can be fixed! My teacher at the workshop said that any manuscript can be made publishable. It is only a matter of how much work it will take to do so. Oh, and do you like my sample book cover? I shot that photo myself from the bottom of a Titan II missile silo. Tee hee. HECK YEAH! You could use that as a book cover! Congrats on finishing your first draft--it's amazing what happens when you get into a groove. I wanna read it!! w00t! I can't wait to read it either! Wow, Rebecca, you are incredible! AND it's a great cover! I am thoroughly impressed, truly amazed, and stricken with awe. I am so proud of you! What an accomplishment!